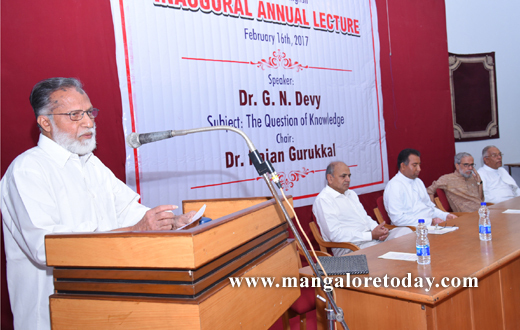 Mangaluru, February 17, 2017: “Human knowledge which was so far based on language of sound is shifting towards language of images. We are today on the threshold of a new future. As human beings are greedy, in this transition there is a possibility of injustice to large sections of the humanity. 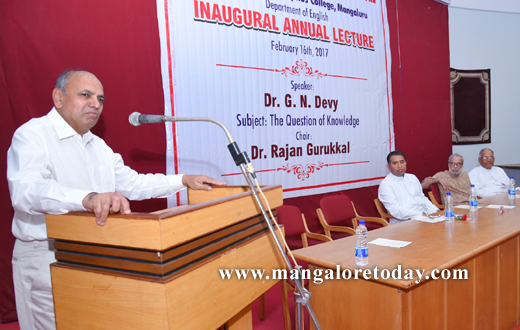 If we want the world to be safe and just, it is time for every student to step out to address the question of inequality,” said the renowned scholar and Padma Shree awardee Dr. G. N. Devy. 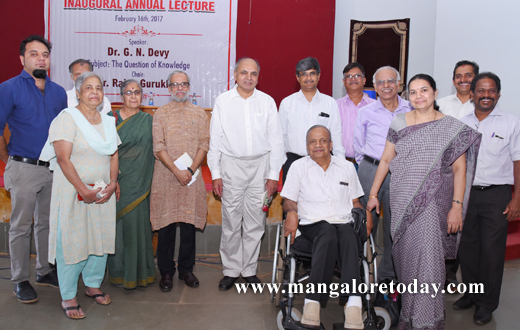 Delivering the maiden edition of the Annual Lecture organized by P. P. Gomathi Memorial Education Trust on the subject “The Question of Knowledge” at St Aloysius College in the city on February 16th, Dr. G. N. Devy explained the genesis of knowledge and communication from the beginning of human evolution, from gestures to intonation to collective memory and language based on sound to the present tendency towards language of images. Giving the examples of historical figures like Socrates, Nicholas Copernicus and Galileo to illustrate that the quest for knowledge is one the important endevours of humanity, he said many a times those who questioned conventional knowledge had to suffer persecution, torture and even death. “In many such cases, the very foundation of knowledge got dismantled and reconstructed again. Knowledge is a process to be learned, not a product to be acquired. Knowledge is not a single narrative, but a system of multiple narratives,” he said. The acceptance of the principle of rationality was a major turning point in this quest, according to Dr. Devy. “Prior to this the universe was seen as a mystery created by god that cannot be understood. The principle of rationality made the universe as something that can be understood by humans with thinking. This idea which gave birth to universal science,” he explained. “With the invention and proliferation of the computer chip which can store memory, humans are tiring of interpreting the language of sound and memory. Human brain is now moving away from this and towards relying on language of images. In this process sound based language will die. 4000 of the world’s 6000 languages and 400 of the India’s 650 languages will die in the next 30 to 50 years. Our entry into that world will be as poor humans, because we would have lost a huge heritage,” he said. Alerting the audience to the looming crisis which can be caused by the shift in the nature of knowledge, he said there is a strong possibility of the rich benefiting from the changed scenario which envisions a merging of the physical and digital world. Tribals, girls, farmers and the poor will fall behind and some humans might just perish. “If we do not address the question of knowledge, we will become slaves of knowledge and not producers of knowledge. We should see knowledge as a means of freedom. Diversity is necessary for evolution. All around we see a dictatorial world coming up. Intuition and fearlessness are the two human responsibilities to prevent technology from dominating us,” he said. P. P. Gomathi Memorial Education Trust has been established by her family and former associates to perpetuate the ideals cherished by the Late P. P. Gomathi, a renowned educationist who had served as the Principal of Besant Women’s College and later as the Secretary of Women’s National Education Society until her death in 2014. 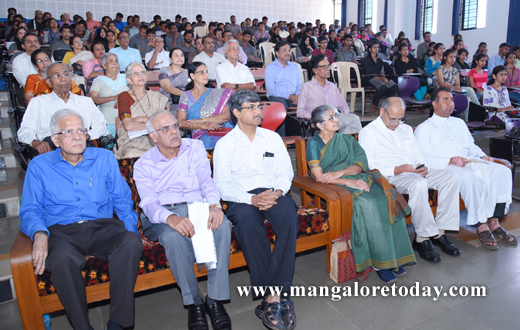 The maiden Annual Lecture coincides with her 87th birth anniversary. The trust plans to give an annual educational scholarship of Rs. One Lakh to a meritorious poor girl student, and also to give incentives to talented young artists. 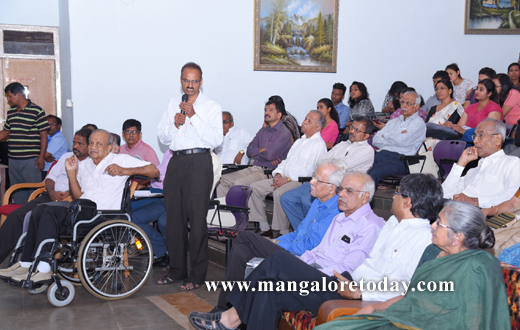 Earlier P. P. Sudhakaran, brother of P. P. Gomathi welcomed the gathering and introduced the guests. Advocate K. P. Vasudev Rao gave a verbal tribute to P. P. Gomathi. Rev. Fr. Pradeep Sequiera, Finance Officer of St. Aloysius College and Rev. Dr. Pravin Martis, Principal Designate of the college addressed the gathering. 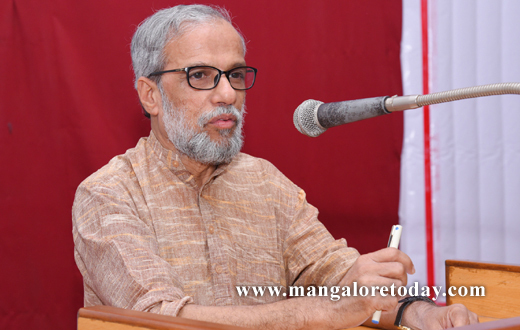 Dr. Rajan Gurukkal, former vice chancellor, Mahatma Gandhi University, Kottayam, presided over the function. Dr. Meera Aranha proposed a vote of thanks. 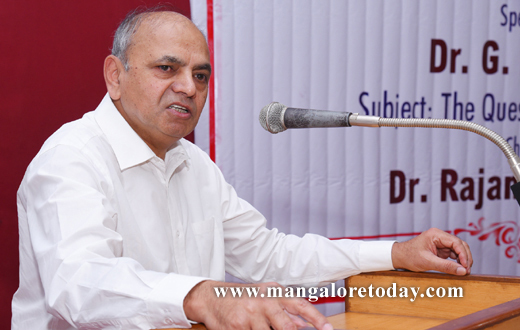 Prof. Ratan Mohanty, Head of the Department of English, St. Aloysius College was the master of ceremonies.